At most companies, this would be maddening. At TeamSnap, it’s irrelevant. We all work from the privacy of our own homes (or wherever we may feel like working). This is the team that brings you TeamSnap! One of the rarely talked about benefits of being a distributed company is that there’s much less opportunity to get irritated with your co-workers. The traditional office model of spending eight to nine captive hours in the same physical space increases the likelihood that everybody’s individual working styles and habits will drive each other nuts. At TeamSnap, everyone can work exactly the way that makes them the most comfortable and productive, with no worry about causing their teammates to go bonkers. And this is important, because a 2008 study estimated that U.S. companies lose over $359 billion in productivity each year due to employee conflict. While some of that conflict is more tangible than “ENOUGH WITH THE TUNA SANDWICHES!” there’s no question that compared to most companies, TeamSnap is exceptionally drama- and conflict-free. We spend a lot more time building our business than being all up in each other’s business. But working remotely doesn’t mean being isolated or alone. At TeamSnap, we interact all day via video meetings, online chat, emails and screen sharing. We greet each other in the morning in our Slack chat rooms and hold end-of-the-day happy hours in Google Hangouts. We celebrate new babies (or new pets) on our employee blog, and we’ve even got a chat channel devoted to sharing the music we’re listening to. Being distributed forces us to communicate more consciously and more broadly. Our online chat rooms make it easier to know people from every department instead of only from within one’s workgroup or cubicle pod. The support team, testers, developers, marketing, sales – we all talk about our weekend plans, favorite movies and fitness goals in the same place online, leading to a deeper sense of friendship across the whole company. Yet despite strongly advocating for distributed teams, we do recognize the value of occasionally spending physical time together. 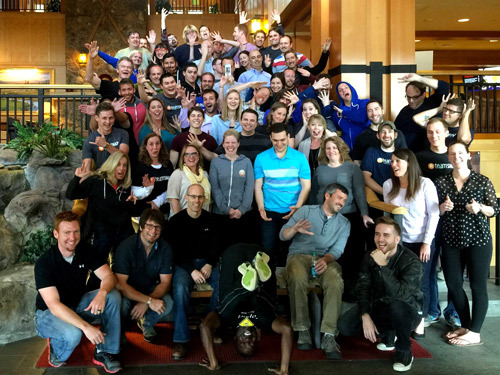 That’s why every six months, the entire company gathers in person at one of our all-TeamSnap retreats. It’s a time filled with laughter and hugs, and finding out who is much taller or shorter than they appear on the video screen (I’m in the “shorter” camp.). This April, we had nearly 70 people sharing a ski lodge in Steamboat Springs, Colo. The energy and excitement was incredible, like a college reunion crossed with summer camp. After developing deep friendships in our virtual world – but without the day-to-day petty annoyances of sharing an office space – when we actually get to hang out in person the enthusiasm and camaraderie is thrilling. Unlike the traditional eye-rolling that accompanies most company “off-sites,” the twice-a-year opportunity to spend time together is a joy we all looked forward to for months. Andrew is TeamSnap’s chief product officer, in charge of making the TeamSnap product grow. He also works in business development, marketing and strategy. In his spare time, Andrew teaches, performs and directs improvisational comedy with ComedySportz.